Of the three sons of Antonio and Lou Aldeguer, it’s the middle child Michael who took after his dad in pursuing a life that’s dedicated to sports. As president of ALA Promotions, Michael has been an aggressor. If he were a boxer, he’s not a counterpuncher but one who’s offense-minded, always moving forward, jabbing and attacking. To date, ALA Promotions is now on its 39th edition of the Pinoy Pride series. I’ve known Michael since we were in high school. He studied in Sacred Heart and I dribbled as CIS point guard and we faced each other many times on the parquet floor. As the year ended last week, I asked Michael to revisit 2016 and to look forward to 2017 (Part 2 will appear on Sunday). While tracing its roots in Cebu and contuining their tradition of holding promotions at home (in April, it was an overflowing crowd at the Cebu City Sports Center and, last Nov., at the Cebu Coliseum), the ALA brand has gone international. Michael is proudest of the impact the fighters have accomplished in America. “We staged more shows that our fellow Filipinos, especially those abroad, could be proud of,” he said, citing the partnership with TV giant ABS-CBN and TFC (including their top-rated Sunday show) as essential to the growth of Phil. boxing. I asked Michael about his appraisal of the ALA fighters. That’s true. In any sport, it’s easy to look good when your opponent is weak; but when you’re up against the best in the world, the scorecard changes. The best example is Albert Pagara. Prior to fighting Cesar Juarez, the WBO #1, he was undefeated in 26 fights and could have continued this no-loss streak by taking the easier route. The ALA boxing gym has dozens of fighters. Michael talked about two of the most promising. Jeo Santisima, only 20, hails from Masbate. He entered the ring four times in 2016 and knocked-out every one of this opponents, including former Phil. 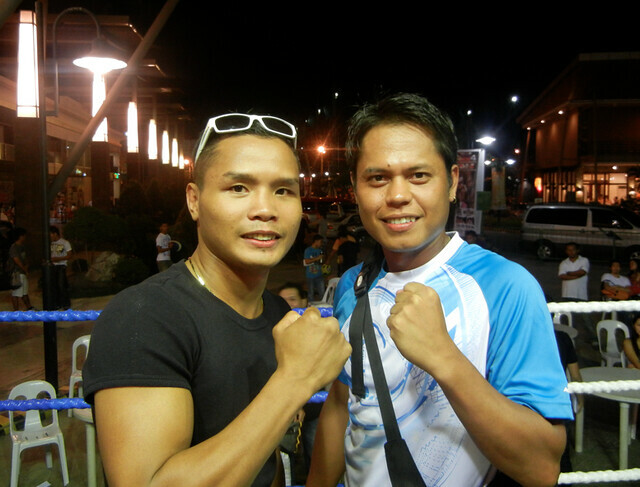 super bantamweight champ Jerry Nardo and former Phil. superfly and bantamweight champ Marco Demecillo. “Santisima concluded this year’s performance with yet another sensational win over multi-international champion Rex Wao last Nov. in Pinoy Pride 39,” said Michael. “Santino” is his nickname and Michael says that he has shown two of the most important factors in becoming a star and a world champion — “great power and heart” — and believes Santisima is one of the hardest punchers in Philippine boxing today. He also cited the undefeated WBO International Featherweight champ Mark “Magnifico” Magsayo. Against veteran and world title challenger Chris “The Hitman” Avalos last April at the CCSC, the 21-year-old from Bohol wowed the 25,000 fans in attendance. If you watch the two sports on TV, you’d conclude that boxing is kinder. The boxing gloves, padded and thick, produce a softer and more cushioned impact. In boxing, only the fists are allowed to crush the enemy. In mixed-martial arts (MMA), it’s every hard-boned corner of your body that you can use to inflict pain: sharp elbows waiting to redden the face, the knee ready to attack the abdomen, the legs and feet springing in action to strike. My wife Jasmin abhors the brutality of the Ultimate Fighting Championship (UFC). While she watches Manny Pacquiao fights (who doesn’t?) and while she doesn’t cover her eyes and grimace when boxers collide, it’s different with UFC as she runs away as if she’s allergic to me. Blood gushing off one’s cheeks. Two men grappling on the floor like male lovers. A devastating knee to injure the ribs. More red liquid spouting out of the mouth. Open cuts near the eyelids. All these absolutely turn off Jasmin. Thus, the conclusion: MMA is harsher, rougher and more vicious than boxing, right? Not necessarily. Last Monday, while browsing Google News, this headline news greeted me with shock: Australian boxer dies in bout against Filipino. Braydon Smith, previously undefeated in 12 bouts, fought John Vincent Moralde in Australia last Saturday. Their fight extended all the way to 10 rounds with the Davao City native winning via decision. At fight’s end, Smith’s face was bruised but he never showed any signs of major physical concerns. Only when he reached the locker room 90 minutes after the fight did he collapse. He was comatose for two days before he passed away last Monday. Shocking. Painful. Horrifying. For how can a 23-year-old leave this world so soon? 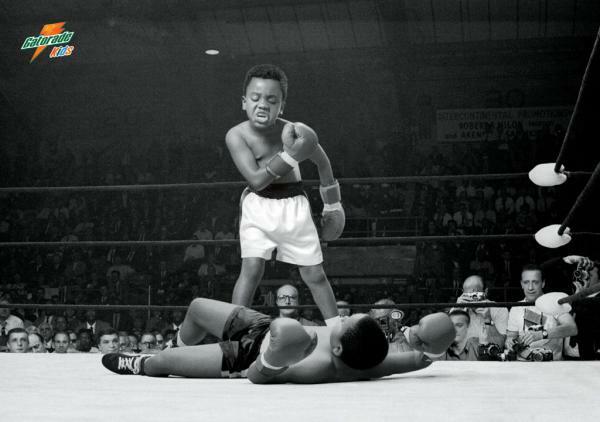 This, of course, was not the first death in boxing. There have been dozens, maybe over a hundred, of similar cases before. And so, I repeat the query: Boxing or MMA? I’m a huge fan of both combat sports, having watched dozens of ALA Promotions fights and, three times, Pacquiao himself in person; I’ve also witnessed a slew of MMA clashes (the URCC promotions — which, sadly, have been discontinued in Cebu) and, last year, the One Fighting Championship (One FC) extravaganza inside the MOA Arena. On TV, though I haven’t been much of a boxing follower (apart from our Pinoys) lately, I rarely miss a UFC telecast. My conclusion? I always thought MMA was more brutal. It’s full contact and ruthless, employing dozens of primitive and ferocious moves. In one URCC event at the J Centre Mall a few years ago, I’ll never forget the spinning back-fist employed by one fighter; as soon as it connected to the head, the opponent fell lifeless, arms and shoulders collapsing to the floor. It was split-second fast, cruel and hurtful. But you know what? It was that … fast. It ended quick. Like many an ending in UFC, once a fighter is down and out, the referee jumps in to stop the contest. No extra seconds of repeated pounding are added to the damage — unlike boxing. Dana White, obviously, is biased in favor of MMA over boxing. (He’s amassed his $300 million net worth from the sport.) But he has a point. As brutal as the UFC looks, the stoppage is instantaneous. A dozen years ago, when Donnie Nietes arrived in Cebu from Negros Occidental, he was only 19. He had studied elementary in the town of Murcia, 20 minutes away from Bacolod — the city where he finished high school in Brgy. Granada. His first job: a janitor. “I worked as a utility boy,” he said. But, while mopping floors and throwing the garbage kept him busy the whole day, his eyes were fixed on another prize: boxing. “My ambition was to become a boxer,” Donnie said. On his spare hours, he trained. Gradually, this diminutive teenager who spoke Ilonggo became the gym’s hardest-worker. When we met last Tuesday for lunch, Donnie was groovy and dapper. He wore a striped long-sleeves polo shirt that folded near his elbows. The color: purple. Same with his shoes; a trendy brand called “DC” worn by skateboarders. Color: purple. On his left wrist was a giant-size watch by G-Shock. His face was clean-shaven except for the goatee. But one question Mr. Aldeguer often asks Donnie, why purple? “I like the color,” said Donnie, laughing. What’s no laughing matter is this: Nietes will be ready for Moises Fuentes when their rematch unfolds two Saturdays from now at the SM MOA Arena. Part of Donnie’s focused training is staying at the ALA gym for two months prior to fight day. Because while Nietes has owned a house through his earnings and resided there for years, he has to sleep at the ALA gym quarters. Nietes is taking the May 10 bout seriously, even if it takes time away from his partner, Mary Joy Cayao, and their two daughters, aged two years old and four months. The stakes are high. 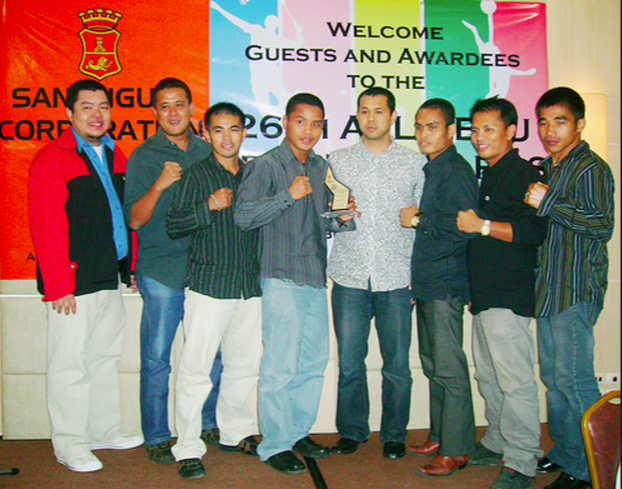 Nietes ruled the WBO minimum weight (105 lbs.) division when he defeated Pornsawan Porpramook in Sept. 30, 2007. “I consider that victory, my first world title, to be the most memorable of my career,” Donnie told me. We had lunch at the Cebu I.T. Park and he pointed to the actual venue — the Waterfront Hotel — which was just a few hundred of meters away. He defended the world title from 2007 until 2011. He then moved up in weight to win the Light Flyweight class, defeating Ramon Garcia Hirales in October 2011 in front of his fellow Ilonggos inside the La Salle Coliseum. We witnessed that historic bout in Bacolod. From Sept. 2007 until now, he’s been world champ — and is just months away from breaking the seven-year record (1960 – ’67) of the great Gabriel “Flash” Elorde. Donnie — who’ll turn 32 this May 13 — still has many years of boxing ahead. He plans to move up in weight soon. This early, he’s looking to the future. He’s a businessman. Two years ago, he opened a rice-and-feeds store in Mansilingan, Bacolod. “My parents, Josue and Renelia, manage the store,” he said. He might also open a Cebu eatery in partnership with some friends. And, looking ahead, he will help train future champions. But, for now, it’s Pinoy Pride XXV. 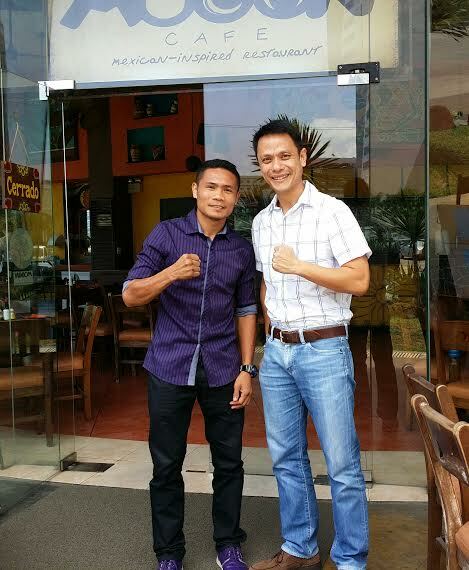 Donnie Liboon Nietes is an extraordinary athlete. If you’re the best 108-pound boxer on Earth, you have to be. Donnie and I had lunch last Tuesday. He was accompanied by ALA gym coach Edmund Villamor. We met at our family-owned Mooon Cafe at the Cebu I.T. Park. Dining at the Mexican-inspired restaurant, Donnie will be facing a Mexican this May 10 at the SM Mall of Asia (MOA) Arena. It’s a rematch against Moises Fuentes. Hailing from Murcia, Negros Occidental, Donnie and I often spoke in Ilonggo. For 75 minutes, we exchanged lots of stories. Donnie’s a huge Michael Jordan fan. Today, he follows the Miami Heat and is eagerly awaiting the three-peat in the NBA Finals. Volleyball? Check. “I often watch inter-barangay tournaments,” said Donnie, who used to play volleyball when he was in elementary. He also swims. Here’s a funny story: Back when he was a little boy in Murcia, their house was a few steps away from the river. Donnie learned swimming this way: His dad Josue would throw him to the water! He had to scramble to survive. Donnie was only six years old then. “I cried and cried because the water was deep,” he said. But, he proudly said, I learned to swim! Edmund Villamor explained that “making weight” is one of the toughest challenges of a boxer. At the ALA Boxing Gym, the target is a gradual weight reduction of two pounds per week. Talking about food, we ordered. Donnie scanned the menu. Pasta? Fish? Chicken? I offered. “I’ll have beef,” he said. The world champ ordered Steak A La Pobre. “With plenty of garlic,” he said. He cleaned the plate with a cupful of garlic rice. Nietes needed the protein. Hours after our lunch, he would be engaged in the final and toughest sparring session of his training: a 12-rounder at 3 p.m. last Tuesday against four boxers who’d alternate fighting him per three rounds. 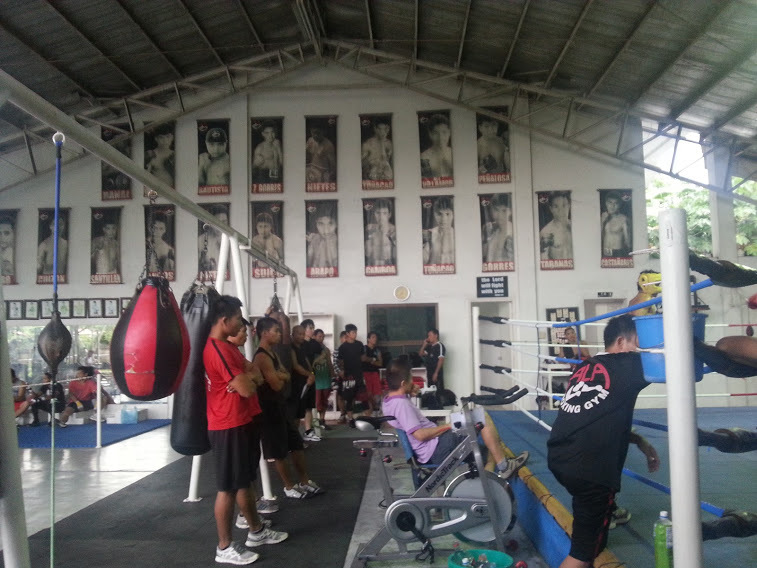 Two of those sparring mates at the ALA Boxing Gym in Cabancalan were Johnriel Casimero and Milan Melindo. SNAKE. We talked about his nickname, “Ahas” (snake). He pulled out his huge Sony phone. Browsing through the photos, he showed me two pictures of him standing in his living room. Shirtless, the boxer wore boxers and, on his neck was draped a white and yellow Burmese Python. RITUALS. Unlike Bradley who doesn’t shower for a week prior to the fight or Marquez who drinks his urine, Donnie doesn’t have any crazy habits. “I pray,” he said. Before arriving at the fight arena, he spends time in prayer. “I’ve been religious since birth,” he told me of his Christian belief. To relax, he loves to lie on his “duyan” (hammock) and listen to Christian songs from Chris Tomlin and Don Moen. Jonas is dead. Only 16, he is forever gone. Not by accident. Not by disease. Not by Yolanda or some type of calamity or 7.2 earthquake — but because of this cruel sport that may not be for kids. Jonas Joshua Garcia wasn’t supposed to box. It was his twin brother Ralph Raven who was set to join the regional meet of Central Luzon. A fourth year high school student from Bulacan, Garcia competed in the CLRAA boxing event. In the first round, his nose bled. Go on, he was told. In Round 2, he felt dizzy and the bloody game was stopped. But it was too late. Rushed to the hospital, he turned comatose. Days later, DepEd announced the most painful of broadcasts: he’s gone. 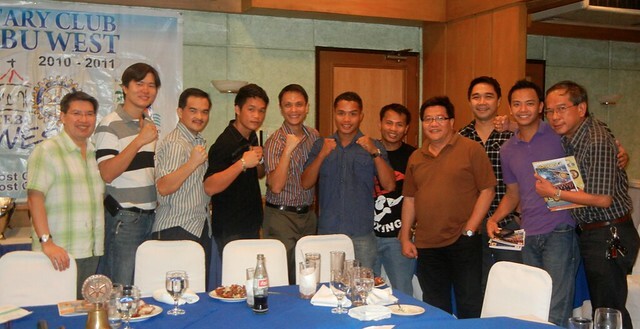 Boxing has not been scrapped from the 2014 Palarong Pambansa. Not yet. It may be. Maybe for the special reason to honor the memory of Garcia, it should be. Today, boxing is under immense DepEd scrutiny, declares the Assistant Secretary Tonisito Umali. According to reports, boxing is not the only sport that is being examined for being unsafe to youngsters. Also under threat are taekwondo, wushu, arnis and wrestling. This may be an overreaction. But this is valid. A parent’s loss can never be recovered. This incident should be debated upon. It often takes a painful moment for the public to pause, reflect and study. Should children do combat via full contact sports? Pacquiao was 14 when he started. But he’s Pacquiao. Is boxing too dangerous for children at such a fragile age? This case is similar. If boxing isn’t banned, as the congressman from Sarangani says it shouldn’t, then how do we ensure, in every town or mall or school, that it won’t kill again? Last December, it was Pacquiao. Last April 6, it was Viloria. The other weekend, it was Donaire. And, last Sunday, it was Boom Boom. Thus far, of world champs and of world-champ-wannabees, it’s been loss after loss for the Pinoys. We know boxing — like chess or fencing — is one-on-one. Of the two gladiators inside the ring, excluding the unwated “tie” (tabla), one will win, another will lose. Bautista? The winner of his first 23 fights, we thought Candijay, Bohol would produce its first ever world titlist in Rey. But, no. After that Marquez-on-Pacquiao-like knockout by Daniel Ponce de Leon in August of 2007, the sound of Boom Boom’s punches hasn’t been Boom-bastic. Should he or shouldn’t he? This “retirement” question has been answered. Boom Boom is still young. He’ll turn 27 on June 19. His record has been impressive: After a 23-0 start, he loses to De Leon but recovers to win his next three bouts. After another loss (to Heriberto Ruiz), he rises once more to win eight straight prior to last Sunday’s fall in Davao. Overall, his record of 34 wins (25 via knockout) and three losses (a 92 percent win-loss percentage) is sterling. ALA, the Father, Antonio Lopez Aldeguer, the man who started the most respected boxing stable in the Philippines back in 1985 — he considers his boxers like his children. I’ve known him for over two decades. I’ve known Michael since high school. The primary concern of father-and-son is — always, always — good health. With Boom Boom, as Michael explains: What for? Boxing, let’s remember, is no gymnastics or ballet. Boxing is a brutal, rib-breaking, jaw-collapsing, mind-bleeding sport. Still, there’s no shame in retirement for Boom Boom. His legacy is implanted in our Cebuano minds. He is one of the most famous — and entertaining — boxers that Cebu has cultivated. Donnie Nietes is the WBO Light Flyweight world champ but, if you ask any passerby from Colon to Waterfront Hotel who they recognize more, the answer comes in two resounding words: Boom Boom. You’ve inspired many. You’ve excited many. Time to hang up the gloves, Rey. JUDGING. I’m glad Bautista “lost.” By glad, I mean I’m happy that two judges correctly saw the fight and fairly awarded the win to Jose Ramirez of Mexico. I saw the replay on ABS-CBN and nobody would doubt the loss of Bautista. Kudos to Salven Lagumbay and Danrex Tapdasan for scoring the fight, 114-111. Imagine the ruckus inside the University of Southeastern Philippines gym if Boom Boom won? MACAU. Is it true that Pacman will fight this October? In Macau? If so, this is the perfect chance for us to watch. This might be Manny’s last fight. Seven years older than Boom Boom and twice a loser in his last two fights, Pacman will retire soon. If it’s in the Las Vegas of Asia, let’s go! Two months ago — on February 5 — Gerry Malixi, a fellow La Sallian who swims and bikes and is married to Sari Garcia, received a phone call. On his iPhone, the screen said: Rachel Donaire. “Hi there! We’re in Cebu!” said the sweet voice of the wife of the Philippines’ most famous boxer not named Manny. Rachel handed over the phone to Nonito. “Hey, Gerry!” said the 4-time world boxing champ. Last Feb. 5, Nonito and Rachel Donaire were in Cebu. Unknown to anyone but their closest relatives, the current King of Boxing flew to our Queen City of Cebu. Gerry is Nonito’s closest friend in Cebu. 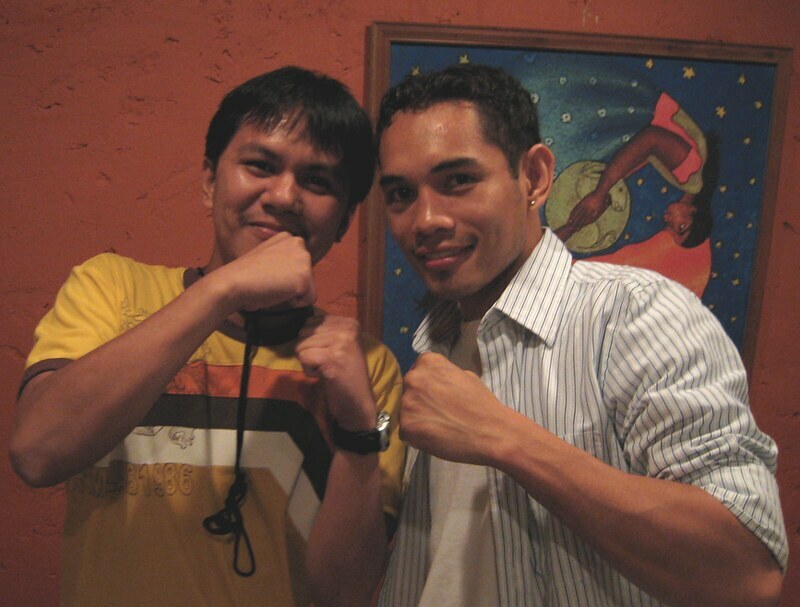 Back in 2007, after Donaire annihilated Vic Darchinyan, the Talibon, Bohol-born champion came to Cebu. When I hosted dinner for the Donaires — Nonito Sr. and Jr. — at Mooon Cafe in Guadalupe (organized by my fellow writer Salven Lagumbay) in Nov. 2007, Gerry was there. So were Cholo Verches, Manny Villaruel, Oliver Kho and Atty. Jingo Quijano. One revelation that will make architect Ed Gallego and his wife Bernadette smile: “He loves La Marea Hot brownie cup!” Gerry said. On money matters, it was Bob Arum who revealed that Donaire will be earning over $1 million in today’s fight. Gerry, a businessman who operates Genergex Petroleum, related to me another anecdote about that 2007 fight between Nonito and Luis Maldonado. The country’s most respected and best-managed boxing facility is not found in GenSan or in Quezon City or in Bacolod, it’s right here in Cabancalan, Mandaue. Last Tuesday, I visited the ALA Gym. Wow. Superstar after superstar I saw. Jimrex Jaca sparred. Rey “Boom Boom” Bautista wore jogging pants and intently watched the hostilities. Genesis Servania sweated. Michael Domingo was there — no longer a fighter but a trainor. I went to visit Donnie Nietes. Humble and always sporting a charismatic smile, Donnie proclaimed himself super-fit (“wala problema gyud,” he said) for next Saturday’s duel at the Waterfront Hotel. “I was not my best shape in Bacolod,” he told me, in Bisaya, referring to his controversial win in October 2011 at the La Salle Bacolod Gym. This time, Donnie is much more confident. As we spoke, he wrapped his fists with white tape. He wore all-black, from foot to head: Asics boxing shoes, leggings, shorts and a shirt plus a head gear that was black. We spoke in Ilonggo. Nietes hails from Murcia, a town 10 kms. from Bacolod. His snake? “Ara didto sa kwarto (It’s in the room),” he said, referring to his good-luck pet snake, Don II. The ALA Gym, found behind the sprawling Aldeguer compound that houses their multitude of businesses (The Islands Group, included), was abuzz with excitement two afternoons ago. They house a track oval for running. A full-size basketball court. Mirrors adorn the walls while various weights of dumbells are ready for use. There are two boxing rings, side by side. 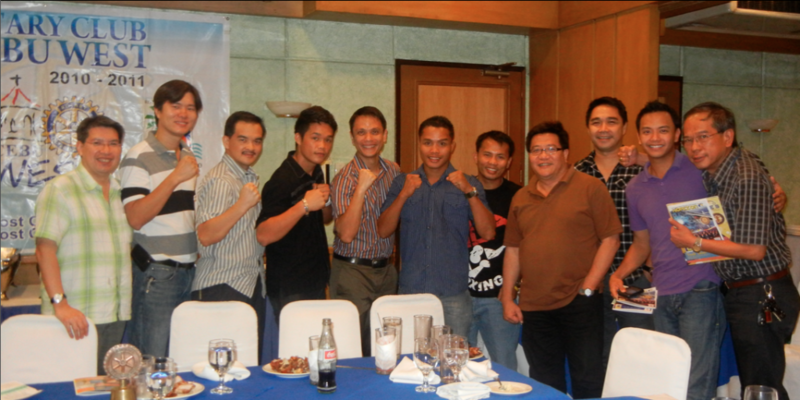 Because the Pinoy Pride XVIII is just nine days away, a who’s-who of Pinoy boxers was present last Tuesday. There were about 50 boxers, including several Japanese. Punching bags, too many to count, stood still, ready for pounding. Above, hanging, were dozens of banners of the ALA Promotions events. In full color, the various Aldeguer boxers were celebrated. Each photo had their family name printed underneath. Minutes after I arrived together with Tommy Frederiksen, the Swedish tennis coach of my daughter Jana, The Godfather himself arrived. Each Monday to Saturday afternoon for the past 28 years since his gym started in 1985, Tony Aldeguer himself is there to supervise their training. He wore shorts and running shoes. And when the sparring started, instead of just sitting down to watch, he climbed the NordicTrack stationary bicycle (which had a plastic sign at the side which said, “For ALA Use Only”). He himself was there to work out. Pedaling, observing, shouting comments to Donnie and to Edito Villamor — all these ALA was doing in his second, every-afternoon home. 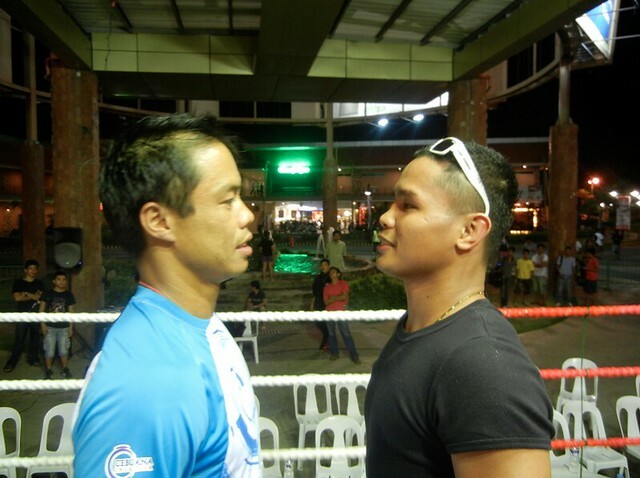 “We’re letting Donnie spar against a taller, bigger opponent,” said “Tito Bidoy,” as I call him. This way, Donnie gets used to the Mexican, Moises Fuentes, that he’ll face next weekend. Donnie sparred for four rounds with Ralph Lulu. They didn’t seem to hold back; they were going all out. This was Donnie’s second-to-the-last sparring session; he spars his final four rounds today. “Donnie might not be spectacular but he’s powerful and very effective,” Aldeguer tells me. Ilonggos. I’m not sure if it’s because Mr. Aldeguer himself comes from Iloilo but his gym is filled with Ilonggos — many from Bacolod and Negros. “They’re very talented,” ALA says. After Nietes’ session, guess who came on board? It’s a sight that we’ll not see anywhere, even in Las Vegas. Milan Melindo versus John Riel Casimero! Milan is scheduled for an April 6 bout (undercard of Brian Vilora) in Macau while the world champ Casimero is headed for Panama next month. Their sparring? I don’t know if a) they both hated each, or b) they wanted to put-up a great show for the audience, or c) they’re just ultra-competitive and want to always give their best… but it was a spectacle. They were out to flatten each other. Shirtless with spiky light brown hair, Casimero (wearing adidas running shoes) was offensive. Seated beside Coach Tommy, we were, literally, at ring-side (beside the ropes) and could feel the power of the punches and the absorbing pain they’d inflict. Milan himself did not relax: he punched uppercuts and wanted to KO his fellow Pinoy. And that’s only the sparring. I can’t wait for March 2. ALA GYM AND ALA PROMOTIONS, WHAT’S THE DIFFERENCE? ALA GYM is an organization that scouts, trains and manages fighters while ALA Promotions Inc. is a promotional firm that stages international boxing events and showcases the Filipino fighters and other fighters worldwide. The goal is to be a global promotional giant just like Top Rank in the US and Zanfer of Mexico. For ALA Promotions, we had a successful 2012 except for the Genaro Garcia issue, as the TV ratings consistently reached new heights never seen before, overtaking the popular showbiz shows (consistently in the #1 position in daytime TV every time Pinoy Pride is aired). The key moments last year were the two events in Manila: the June event in Resorts World and the first boxing event in the SM MOA Arena in October. They gathered respectable crowds, more than what we expected. It was the first time in Manila in years that ticket prices for a boxing event were sold that much. The most expensive tickets were the first to be sold out. For ALA gym, it was a successful year except for the Banal loss. Donnie held on to his crown and is now the longest-reigning Filipino world champion and could be the second longest Filipino world champ in history next to flash Elorde. Boom Boom had his best year injury-free. Milan made a name for himself with wins against named opponents. Jason Pagara had a sweet revenge in knocking out Rosbel Montoya; the rise of Genesis Servania in knocking-out former world champ Genaro Garcia in Manila and Rocky Fuentes winning and defending his OPBF title in Japan. PLANS FOR 2013/2014: To stage more events, bigger fights with bigger name opponents. We have been working in bringing the Pinoy Pride series to the US. Hopefully, it will happen late this year in San Diego, CA and in the Middle East. In 2015, we are looking at staging events in Europe. Also, we did over 70 shows last year and are looking at over 100 events this year. Our TV partner ABS-CBN and sponsor Asia Brewery Corp. want more shows. DONNIE. The Nietes vs Fuentes will be the start this year as Moises Fuentes is the WBO 105lb World Champion and will go up in weight to challenge Nietes. In his last fight, Fuentes knocked out Puerto Rican legend Ivan Calderon. This could be the toughest fight for Donnie. We hope to stage the fight here in March but the negotiations have not been easy with Zanfer, the biggest promoter in Mexico who handles Juan Manuel Marquez. They want the fight in Mexico. With Marquez’s win, Mexico Boxing is at its peak which means they have the power now. AJ BANAL. He’s one fighter who has been in the microscope since he was 16 when GoldenBoy signed him up and at 17 he fought in the undercard of the biggest fight in history Mayweather vs Dela Hoya since then the expectations were higher not allowing Banal to grow into his own. At 19, he fought for a world title and lost in front of his hometown fans, which was a traumatic experience for him,after four years we all thought he got over it but again it turned out to be the same thing all over again. Banal is only 24 and is still young, its up to Banal if he can comeback or not, Just like Villoria, he was knocked out by Carlos Tamara 3 yrs ago and is back now at his best at 32 yrs old. WHO TO WATCH. Milan Melindo should have a title shot this year and we hope to get some big names for him. Genesis Servania needs a break out fight, Jason Pagara has shown Maturity, Rocky Fuentes and Jimrex Jaca is ready for a title shot. POTENTIAL. Young fighters Prince Albert Pagara and Melvin Gumban from the ALA gym but we also have potential young stars fighting under ALA Promotions but from different stables.. Undefeated Arthur Villanueva and Merlito Sabillo, Lorenzo Villanueva, Marlon Tapales with more young fighters joining us soon. UFC? I am not so familiar with UFC and MMA but I know its gaining ground. Still, I believe boxing will always be what it is because of its history and tradition. No question UFC has a brilliant promoter in Dana White but boxing has Bob Arum. The problem with boxing is politics. Take Golden Boy and Top Rank, they refuse to make the big fights because they can’t work together. It destroys the sport. PACMAN. Manny will have to evaluate himself if he can focus on boxing 100%; if not, he should retire. It’s a demanding sport. Marquez knocked Manny out because he was 100% focused and Manny was not. Manny still has it as he was winning until he got careless and walked into the punch. It’s best for Manny to fight a tune-up first before a rematch with Marquez. He should go back to his strength training and conditioning which he didn’t do in his last fight. The Parkinson’s disease report was unfair to Manny as the doctor did not even personally check him. Manny knows his body more than anyone but I agree with Bob Arum: have further tests in the US. NBA? Miami Heat will win again. My best player: Lebron James. What the Mexican did to Pacquiao, he did to a Mexican. We often talk about the “passing of the torch;” the act of a younger, newer champion taking over from the aged, near-retiring legend — and that’s what we witnessed in a span of one week. Twice, I’ve sat down and talked with Nonito. The latest one was during the yearly Cebu Sports Awards when Nonito and Manny Pacquiao were special guests at the Casino Español. It was the 27th SAC-SMB Awards Night in 2009. 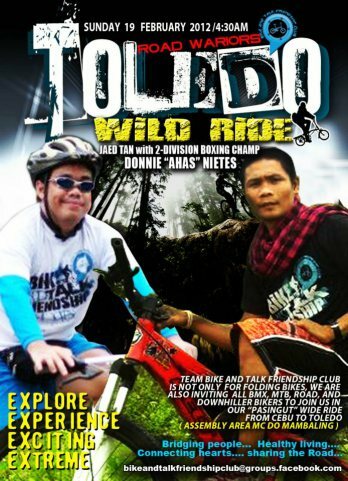 Our first meeting was back in November 2007 when Salven Lagumbay of Cebu Daily News introduced us. That evening, we invited Nonito, together with a group of friends and media personalities, to Mooon Cafe. Nonito Jr. and Nonito Sr. were together. And, after a few hours chatting with them, you leave the room with the same feeling: it’s hard to find a nicer, more gentleman-like duo than the two Nonitos. With Nonito Jr., my initial reaction was this: As nice and amiable and respectful as he is, is he a boxer, one who bloodies and “puts to sleep” opponents for a living? As we saw against Jorge Arce and three others this 2012 (Wilfredo Vasquez, Jr.; Jeffrey Mathebula; and Toshiaki Nishioka), the 30-year-old “Flash” is a certified world champion. In boxing, he’s proven that it is possible to both be friendly (off the ring) and destructive. Jasmin hates it! Blood gushes out. Elbows strike. Bones crack. Arms strangle the neck. Faces turn tomato-red. Kicks fly and snap the jaw. Shoulders get dislocated. Ha-ha-ha. But I enjoy the Ultimate Fighting Championship. Every time it’s broadcasted on SkyCable, I get stuck. It wasn’t always this way. Though I’ve been a boxing fan ever since the days of Hagler, Leonard and Duran, when I started watching mixed martial arts (MMA) on Balls TV a few years ago, I’d cringe. It was animalistic. Barbarous. My thinking: They’re going to kill each other! Someday, sometime, someone’s going to die from this sport! But, as Balls TV showed more coverage and as I watched St-Pierre and Silva and Machida and Jon “Bones” Jones, I watched more and more. UFC is fantastic. It’s fast. It’s not as boring as the patsy jabs and uppercuts of boxing — there are dozens of styles ranging from muay-thai to jiu-jitsu to karate. And, while I used to think that MMA was much, much more violent than boxing, the opposite may be true: because the fight gets stopped quickly, the damage caused on one’s brain, for example, (after repeated pounding) is less. My verdict? Excluding, of course, Manny Pacquiao and our Cebuano boxers from ALA, I choose to watch UFC over boxing. There’s a major fight almost each week. Last week it was Silva vs. Bonnar; a few weeks later it’s St-Pierre inside the Octagon and, weeks after, there’s Henderson-Diaz and, next, Dos Santos – Velasquez. UFC is easy to follow. After UFC 218, there’s 219… and so forth. There are no WBOs or WBCs or IBF or WBA. There’s no confusion. Light heavyweight champion? 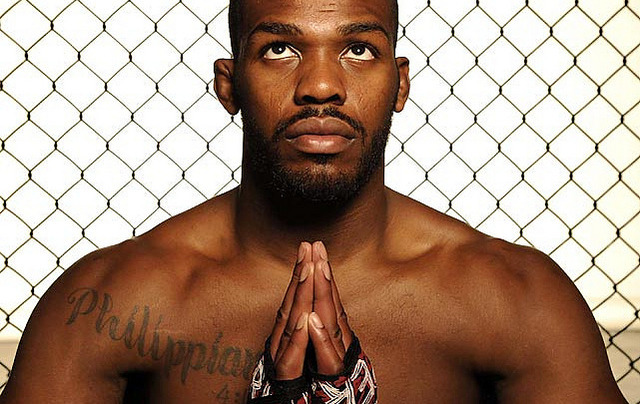 There’s only one: Jon Jones. Middleweight champ? Anderson Silva. Welterweight? Georges St-Pierre, the friend of Pacman who also trained under Freddie Roach. Money. That’s another reason why UFC beats boxing. Though they’re as famous as their boxing counterparts, the UFC fighters earn only hundreds of thousands of dollars compared to the tens of millions by Mayweather, Pacman, etc. This thirst-for-money issue is why Money will not fight Manny. Mayweather is demanding $50 million plus-plus for one fight. Crazy. Lastly, the undercards. In boxing, the undercards in Las Vegas world title fights are lousy. Everybody is focused on just the Main Event. Haven’t you noticed the empty seats in MGM Grand just 60 minutes before a Pacman fight? Nobody wants to watch the nobodies. Not in UFC where almost every undercard fight is thrilling. My point: Boxing has to innovate. It’s the turntable (plaka) in the era of iTunes, the Hallmark cards in this age of Facebook; it’s Barry Manilow versus today’s Pit Bull. While in Metro Manila last weekend, I watched two sporting events: the 4th National Milo Little Olympics and the AJ Banal championship fight. First, Milo. Their opening ceremony last Friday was spectacular. After Ricky Ballesteros wowed the Milo officials with his opening act here at the CCSC three years ago, the high standards have been set. Marikina City was a superb Milo host. So was Nestle, who spared no expenses to give the best; all athletes received green shirts, jackets, bags, magazines with their names printed on it, plus nicely-crafted medals for the winners. 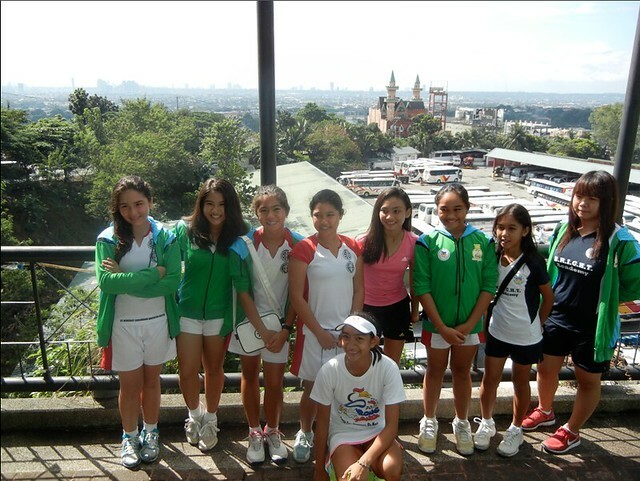 For tennis, our elementary and high school girls played at the Marist School. That was the same venue as football — won by our Team Visayas. 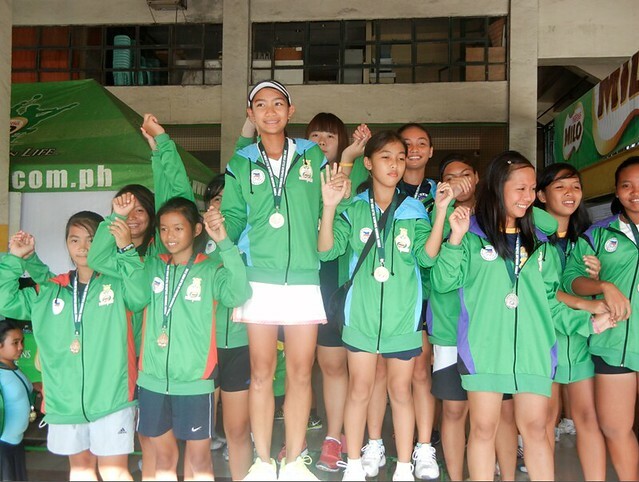 For the high school girls, we defeated Luzon, NCR and Mindanao to win gold. My daughter Jana, who played singles, won her matches with impressive scores: 8-0, 8-0, 8-3. Jana’s other teammates from Bright Academy were Stephanie Kim, Shyne Villareal and Anday Alferez. In the elementary girls, we won silver. Led by Kara Salimbangon, who won all her games, we barely lost to Mindanao in the finals. Still, a proud silver-medal achievement for the St. Benedict girls. Kudos to coach Ken Salimbangon. MARIKINA. The past three days, I drove all over the streets of the country’s Shoe Capital. You know what impressed me most? The bike lines. Everywhere in Marikina, there is a dedicated lane for bikers. We should adopt this! Imagine if more people biked? In a trip to Copenhagen and Amsterdam several years back, everybody biked. There’s less pollution, less traffic and we’re all healthier. (Ask Jourdan Polotan about climbing Maria Luisa.) With the BRT project to be realized, why not include dedicated bike lanes as part of the master-plan? MOA. It stands for Mall of Asia. It also stands for Milo’s Most Outstanding Athlete. At the SM MOA Arena, one word best describes the entertainment complex, said Rico Navarro: beautiful. Yes, it is majestic and world-class. Our seats were soft and cushiony. When Randy Villanueva brought me a cup of beer, the seats had bottle-holders ready. A giant LCD screen with the most advanced scoreboard loomed at the center. The aircon? Colder than Cebu Coliseum’s! Imagine if, a few years after the SM Seaside City rises at the SRP, it also decides to build such an arena. Let’s hope. BANAL. Driving for over an hour from Marikina to the Mall of Asia, I arrived past 8 P.M. Jason Pagara was next. His fight started and finished in haste. It was over in a minute as the enemy quit. Boom-Boom Bautista fought next. Though the fight was close and a split-decision decided the outcome, it was obvious that our Boholano won. Their Round 2 slugfest was one of the best three minutes I’ve witnessed. Still, despite the win, it wasn’t an overly remarkable or superb result. Boom-Boom defeated the Mexican but can he win a rematch vs. Daniel Ponce de Leon? With Banal vs. Sor Singyu, from rounds 1 to 8, it was entertaining. No one backed off. AJ attacked. The Thai stepped forward. When AJ trapped him against the ropes, Sor Singyu shielded himself then unleashed his own retaliatory barrage. Wallops on the head were countered with pummels to the abdomen. AJ’s right upper eye bled. Low blows were repeatedly thrown by AJ. Up until the 9th round, I thought AJ led the scorecards. I thought it would end in the 12th without any KOs. But, like I was at the Cebu Coliseum four years ago to witness AJ’s shocking surrender, the same shocking end followed last Saturday. Lack of training? Lack of stamina? Of heart? Prior to Round 9, AJ didn’t look beaten. He was exchanging strikes with punches. He looked alright. Then again, we didn’t know what his mind and body felt. Sadly, in the 9th, the worst-scenario moments arrived: AJ was punished, leaned against the ropes, almost fell off the ring in what should have been a knock-down; then, seconds later, after a succession of blows, AJ collapsed. He stood up but his eyes said it all: No Mas. Of the hundreds of sporting events that I’ve witnessed in my life, the date “December 2004” stands out as unforgettable. It was a fight between a Thai and a Pinoy. Eight years ago, Manny Pacquiao, then a rising star — but nowhere near his worldwide celebrity/billionaire status of today — fought a Thai named Fahsan 3K Battery. The venue was The Fort. It was open-air. Jinkee was seated behind us. With one punch, Pacquiao damaged the abdomen of 3K Battery. The Thai flew on-air in Taguig. This Sunday, a similar occurrence will unfold. It’s in Manila. It’s a world title bout. It’s a Pinoy vs. a Thai. Can Alex John Banal duplicate Manny’s feat? Those words were uttered by Michael Aldeguer, the president of ALA Promotions, who spent millions and took months to organize this event. “This is ALA Promotions’ biggest promotion this year,” added Aldeguer. One of the reasons why this is huge is because six different nationalities are coming to fight. Usually, it’s just the Mexicans. This time, it’s six nations represented. No wonder the event is called Pinoy Pride XVII – Philippines vs. The World. True. While Ateneo beat UST in SM’s MOA Arena and Lady Gaga had performed there, there had been no boxing spectacle. This Sunday will change that. There’s a good chance I’ll watch the fight “live” this Sunday. I’m excited to visit the MOA Arena. Some friends commented that it’s nothing special. The workmanship, they said, was unlike the reported “NBA-like standards.” But others say otherwise. Well, there you have it. I’ll submit my actual inspection after this weekend. Banal is not the only mega-fight. Rey “Boom-Boom” Bautista also plays a starring role. BOXING. I’m watching this Saturday night. The fight at the Waterfront is called “The Rematch.” And aptly so: the last time Jason Pagara faced Rosbel Montoya, our Filipino boxer lost. This Mexican fighter is seasoned and tough: He’s won 34 times with 29 knockouts. That’s a scary record. And so, while previous ALA Promotions events featured our Pinoys sporting the upper-hand, this time, it’s obvious that the enemy is stronger. Can Pagara avenge his previous defeat? Abangan. Our Philippine team? Zero. As expected. In almost all events, we lost early. The last time Team PHL won a medal? That was in 1996 when Onyok Velasco won silver. That’s four Olympics ago. In Sydney, Athens, Beijing and London, we’re zero for zero. Worse, in the sport where we have the biggest chance (boxing), we only sent one boxer (a wrestler?) to London. Conclusion: While the other nations get stronger, we’re staying the same or weakening. With the Olympics’ current roster of 26 sports and 302 events, it’s hard to picture us winning gold in Brazil. Our only chance? If the IOC includes any of these three popular games: billiards, bowling or dancesport. YONG VS. TIMEX. It’s happening again. Two years ago, one of the biggest running events — the University Run, organized by the CebuDoc group and Dr. Yong Larrazabal — collided with an unexpected rival: the Pilipinas International Marathon (PIM), sponsored by the International Pharmaceuticals Inc. (IPI) group. Both events were held on the same morning of Aug. 15, 2010. This Sunday, two years fast forward, it’s de ja vu time: the 7th University Run (dubbed UR7) is met with another stiff resistance: the Timex Run – Cebu. Same day. Same time. Coincidental? Yes. But unfortunate because both are outstanding. Rio de la Cruz, the famed coach/celebrity organizer, is teaming-up with the Pangilinans (Anthony, Maricel and family) for Timex, to start near the Abellana (Cebu City Sports Center) grounds. Piolo Pascual is expected to meet and greet with his fans. UR7? It’s held at the Cebu Doc Univ. campus at the North Reclamation Area and, with their school’s thousands of students, it will surely be a full-capacity race. Though Timex is conveniently-located in Cebu City, I think the hard-core runners won’t miss the chance to run 25K and climb the three bridges (Cansaga, M. Fernan, and the old Mactan Bridge). Either way, what’s sure is this: the streets of Lapu-Lapu, Mandaue and Cebu (like it was two weeks ago during the Cobra Ironman 70.3) will be flooded with athletes this Sunday. GLOBE. I’ve long been a loyal and satisfied Globe subscriber. So are all of my family members. But, starting last Saturday, a troubling occurrence happened. From where I live in Maria Luisa, there’s hardly any Globe signal! All part of the supposed “upgrade” of Globe? No wonder the TV stations are inundated with commercials by Smart on dropped calls, etc. Paging Globe and my friend Vincent Ong: kindly fix this not-so-smart problem. Michael Pastrano Aldeguer and Bob Arum recently met. One of the top prospects that the chieftains of ALA Promotions and Top Rank discussed? This is outstanding news. Are we anticipating, possibly in Pacquiao’s next Las Vegas encounter this May or June, an ALA boxer to be featured in the undercard? We hope so. Because… sayang. In nearly all of MP’s mega-fights, with tens of millions of eyeballs watching, no prominent Pinoy was featured in the undercard. With this ALA-Top Rank initiative, we might see a change. But, before thinking of Las Vegas, it’s Waterfront Cebu City Hotel and Casino this Saturday, January 28. It’s the 11th edition of Pinoy Pride and Melindo is fighting another Mexican, Juan Esquar, in the 112-lb. Flyweight Division. With Milan’s opponent, Juan Esquer, is he: A patsy? A whipping boy? 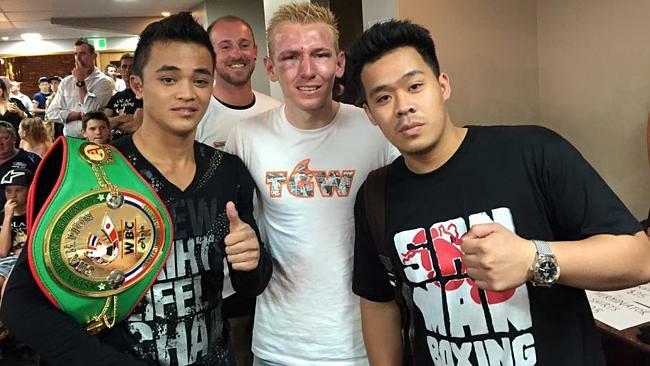 A sacrificial boxing lamb ready to be bloodied by the undefeated (in 25 fights) Milan Melindo? 100 percent sure? What I’m 100 % sure of is this: This Saturday will be a carnage. 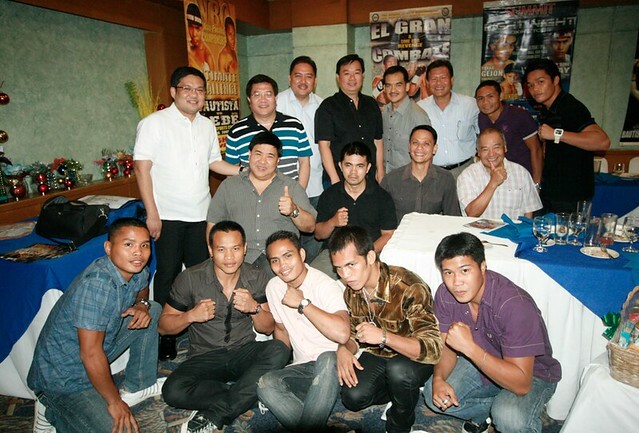 Jabs, wallops, uppercuts will bombard Lahug. Three nights ago, inside the Hoops Dome of Lapu-Lapu City, there transpired a circus. The clown was a Canadian. Shirtless, bald-headed, and wearing the attire that all clowns wear (gold tennis shorts with yellow socks and yellow Nike hi-cuts), he was the comedian. Opposite him was a serious, all-business-like A.J. Banal. Tyson Cave, now nicknamed ‘The Caveman,’ acted, well, like a caveman. He bent low, hunched forward, gritted his teeth, hopping side to side. Hailing from Halifax, Canada, the 29-year-old promised to entertain the crowd and to dispatch of Banal. He achieved the former; he failed miserably in the latter. Sport is entertainment. It’s fun; it’s a show. We watch sports to evoke our emotions, to get titillated; possibly, angered. The Prince of Hali, as Tyson was formerly called prior to his new “Caveman” moniker, was entertaining. Together with Lapu-Lapu City Mayor Paz Radaza and Councilor Harry Radaza, I sat at the front row. We were right behind the corner of the ALA Gym boxers. The Hoops Dome (with tickets priced as low as P100) was nearly 100 percent full. Cave taunted Banal. He laughed at him; cried when a low blow was delivered. Once, when the comic fell to the ground and had his eyes locked on Banal’s ALA Gym coaches, he spewed invectives. In Round One, Tyson lifted AJ and catapulted him to the ground. In Round Two, he did the same. Was this wrestling? The UFC? His tactic—from the day he arrived Monday last week—was obvious: to outrage, to mock, to distract, to puzzle Banal so that the 22-year-old from Ermita couldn’t enact his Mactan game plan. Both fighters weighing-in at 117.75 lbs., it was Cave whose ego was overweight. Only 20 minutes left prior to his bout, he was still walking about, high-fiving the Hoops Dome crowd. Tyson’s a prankster; not a boxer. Inside the ring, he shuffled his feet, showing off his footwork, as if to dance Footloose. His body splashed with tattoos all over, he leaned forward fronting Banal, with no defenses to cover his face, always tormenting and provoking. Crazy. Entertaining? Yes. Boxing? No. Dirty tactics? Oh, he had plenty. He’d throw low blows against AJ. He hugged AJ, lifted him up, then carried him down to the floor. Binuang. In the end, when Banal suffered a deep cut above his right eye that elicited an outflow of red fluid, the fight was stopped with 28 seconds left in Round 8. Banal won via unanimous decision. Did he deserve it? Absolutely. It was one-sided. But, what was Tyson Cave’s reaction, when interviewed by writer Monty Mosher of The Chronicle Herald of Canada? With AJ, it was a pity to see blood dripping off his cheeks and chest starting the 4th round. From that time on, he was a one-eyed fighter. He winced. His sight was restricted. Had there been no three-centimeter cut, he’d have KO’d the laughingstock enemy. In the end, the crowd booed. Fans never want to see a fight stopped. When Tyson walked towards his dugout, he was heckled. I saw someone throw a plastic bottle at him. Still, as non-boxing a fight as that was, it achieved a purpose: Compared to a few spiritless fights in the past, this one was humorous, insane, wild, entertaining—a circus unlike anything Cebuanos had seen before. Rey Bautista woke up at 5 in the morning last Friday. He stretched, got dressed, laced his running shoes, and stepped out of the Nasipit, Talamban location of the Antonio Lopez Aldeguer Gymnasium. It was 6 a.m. After two hours of slow-jogging, he returned to the ALA dugout, where he’s slept and resided for over nine years now. “Wala ko ma-hadlok (I’m not scared),” said the boxer known as “Boom Boom.” The “hadlok,” or scare, refers to Heriberto Cuate Ruiz. Out of the 32 men that Bautista has faced on the square-shaped stage, B-B-B has won 30 fights (23 by knockout) — and he’s lost only twice, to Daniel Ponce de Leon and to Ruiz. I am not a boxer. I do not know the dizzying effect of a right hook, a stabbing left wallop or a jaw-breaking uppercut. Bautista experienced those. 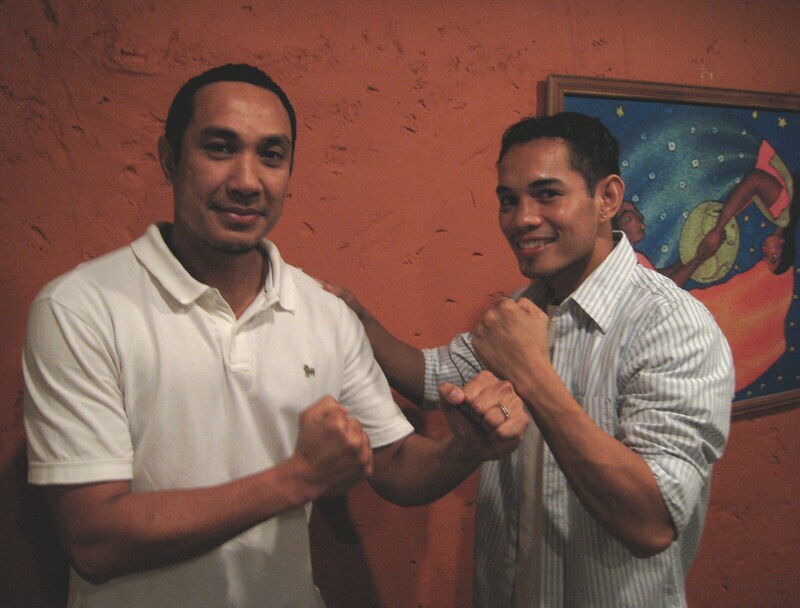 In his Nov. 22, 2008 loss to Ruiz — via unanimous decision with the judges’ scorecards of 80-70, 78-72 and 77-73 — our Boholano was castigated by the Mexicano. Yet…. Wala ko ma hadlok. That’s the confident statement of Bautista, with just 13 evenings to go before his Part II encounter vs. Ruiz. That left hand injury was diagnosed as “a rotten bone” on his wrist. Bautista had surgery following that fight and, according to reports, had that rotten wrist bone replaced from another bone from his hip. It took one year before Bautista fought again. That fight was in 2008. The rehab, in 2009. We’re 2011. Time elapses. Wrist wounds heal. Rey was only 17 then. He’ll turn 25 eight days after the June 11 fight… on June 19. What birthday gift will you reward yourself if you win? I asked. Boom Boom chuckled. Because as serious as Rey Bautista has been in training, off the boxing court, he is relaxed, even funny. I’ve experienced this first-hand. The past few months, we’ve been together on several occasions. As president of the Rotary Club of Cebu West, I invited the entire top-notch stable of ALA Gym fighters to our Tuesday night meeting. This was last December. Surrounded by Donnie Nietes, Mark Melligen, AJ Banal, Z Gorres, Jason Pagara, Milan Melindo, and Rocky Fuentes — an All-Star cast from the A-team of Aldeguer, one man stood out as the most popular. He’s from Candijay, Bohol and stands over 5-foot-6. Boom Boom, in the Q & A portion of that Rotary night, laughed a lot. He’s a joker. And, later that evening, he showed his being a ladies man by cozying up with our club assistant, Ms. Emma Gallos. A month or so later, Boom-Boom joined our meeting again. Afterwards, we partook of yoghurt ice cream at John Young’s yoghurt bar. Justin Uy was there. So was Johnny Siao. We stayed up past 10:30 p.m.
Then, during the Davis Cup tennis weekend last March, there was an open-to-the-public sparring session at Parkmall. Boom-Boom shook hands with the tennis team. Then, in one unscripted but unforgettable moment, the two famous men — Boom Boom and Cecil Mamiit of tennis — stood at the center and, with similar heights and muscular builds, stared eyeball-to-eyeball, as if all-set to fight. Laughing ensued. It was fun. Boom Boom, as intense as he is when the fight nears, has fun. He’s funny. Let’s all pray that, two Saturdays from today, when the jampacked Waterfront Cebu City Hotel and Casino gets a rousing entrance parade — with matching “Boom Boom Pow” loud music in the speakers — that Bautista will entertain the Cebuanos via a KO win. One of those two billion videos I watched at 6 p.m. yesterday. It was a 13:23-minute clip and three men—Bob Arum, Antonio Margarito and Manny Pacquiao—spoke during the press conference two days ago in Los Angeles. What did I see? Antonio Margarito stood up next. Donning a shiny black leather jacket and wearing eyeglasses that made him look like a UCLA student with spiky hair, “Tijuana’s Tornado” spoke in his native Mexican language. Sporting a yellow Abercrombie & Fitch shirt and wearing his usual mustache and goatie, P-Manny rose from his chair and alighted the pulpit. Camera bulbs flashed. Hands collided. Applause reverberated throughout LA. Rep. Emmanuel Pacquiao spoke. His English, despite his hurried training in the halls of the Batasang Pambansa, sounded crooked. But never mind. Because when Manny talks, his facial expression does the talking. He smiled. For doesn’t Manny love to smile? And, when he does, don’t we return the favor and smile, watching our greatest-ever athlete enjoy himself on center-stage? For that’s the originality of Pacman. While the Tysons, the Mayweathers, the Hattons wear the ugliest of frowns during press gatherings—as if there was a “Who Can Frown Best Wins” contest—with our fighter, it’s the opposite. Manny grins. His face is no boxer’s pugilist face that will scare your 5-year-old boy. He’s the most relaxed, casual and laid-back man in this sport that demands fighters not to be relaxed, not to be casual and never to be laid-back. With the press-conference, it was a feel-good story. Again, so unlike-boxing. 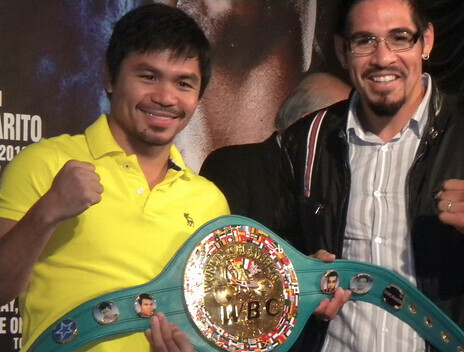 Even Margarito, seated to Manny’s left while our boxer spoke, was seen amused and smiling as his enemy spoke. And you want to hear the best part? To greet the Mexican crowd—plus Margarito, our fellow Pinoy spoke Mexican. No kidding. Though I couldn’t decipher what he said, it was amazing to hear Manny recite several words in his opponent’s native tongue. Was this a beauty pageant? A Mr. Universe contest to see who’s the kindest on-stage? No. It was Manny as Manny. That’s who he is. Finally, the two stood up, holding the golden belt, and faced the cameras. It was a marvelous sight watching a 160-plus-pound behemoth of a man who stands an inch short of 6-foot-tall beside a baby-faced Asian who used to fight 105 lbs. But, as we know from one of the bible’s most famous clashes, the smaller yet more cunning fighter catapulted his weapon to obliterate the giant. Let’s hope for the same on Nov. 13. Let’s admit it. Floyd Mayweather, Jr. was outstanding. As much as 100 percent of us Filipinos hate his mouth and detest his ego, on the ring, he’s sensational. During those 180 seconds during Round 2, didn’t we all jump in excitement, shout, pray, and wish that Shane Mosley would finish him off? Yes we did. But, shock of shocks, Sugar turned old and stodgy one minute later in Round 3 while Floyd, usually a defensive expert, turned into an offensive generator. Mosley owned a small window of opportunity—which was promptly slammed close by Mayweather. Stamina? Well, what can you expect from a 38-year-old? Starting the fifth round, Shane’s face was empty. His tongue wagged. He was tired while Floyd, in between rounds, never looked fatigued. Floyd’s endurance can be likened to someone you and I share the same color skin with: Manny Pacquiao. Which brings me to The Fight. 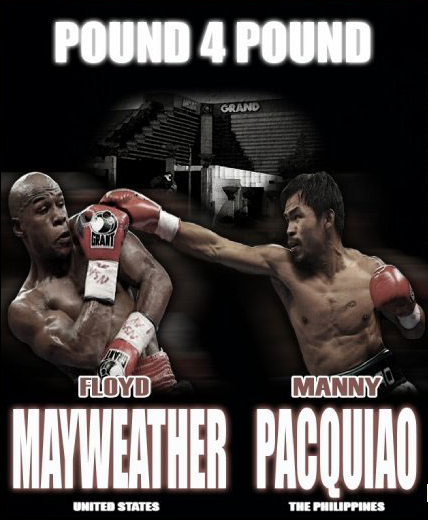 Can you imagine Pacquiao vs. Mayweather? Two of the fastest athletes facing nobody else but each other’s speed inside the 18’ x 18’ stage. They’re swift, snappy and fire quadruple combinations in rapid-fire sequence. Ever seen Manny fatigued in Round 12? Same with Floyd, right? “Forget world peace, the world needs Mayweather-Pacquiao,” one columnist, Mark Whicker, titled his story. True. This is a marriage that Americans and Asians want, that boxers and non-boxing fans salivate at watching; it’s a 36-minute encounter that would boost Money’s income by least $25 million and Manny’s by over one billion pesos. Which is why it’s not going to happen. In the same way that some candidates, however qualified and best suited, will not win this Monday’s elections. That’s how the world operates. Life’s unfair. Not everything we wish, we get. And this is one wish we won’t get. Pacquiao won’t agree because, he says, blood will sap him of energy when, in fact, it’s just a little needle and small volume that they’ll extract. Floyd’s asking for “14 days before the fight” for his blood test while Manny’s OK with 24. This means that only 10 days separate a “Yes” from a “No.” That’s pride. Worse, Mayweather, without question the most boastful human being in this universe today, wants everybody to bend to everything that he wishes. He doesn’t think he’s Muhammad Ali; he believes he’s boxing’s God. That’s pride. “This is not bragging or boasting,” said Mayweather in the press conference shortly after the fight (yeah right! ), “but with or without Pacquiao, Floyd is going to be able to go out and make $20 million or $30 million a night. With or without him, I’m still able to do that. Pina ka hambog na tao sa tibuok kalibutan. So, what complicates matters now is not only blood-testing but money. After his victory 48 hours ago, do you think Mayweather will settle for a 50-50 share, like he originally did months ago? No way. Money wanting more money is what Money wants. Back to our own Manny and the blood-testing issue, here’s what I would advise our man: Agree to 14 days. We know, Freddie Roach knows, and Buboy Fernandez is certain that Manny does no drugs. Then, what’s the scare? Pride? Well, this pride is expensive at P1,000,000,000. From now until November—the month when Bob Arum wants the fight—Manny can simulate this blood-testing procedure and know that it won’t debilitate or weaken his body. Then he beats Mayweather! Because Floyd, for all his defensive prowess and ability to adjust, is beatable by Man. For Floyd doesn’t possess Manny’s power. Quickness, yes, they two are the same, but power, I’d tip the favor to Manny. So, there. The enemies: Cash, blood, pride. Manny Villaruel, the sports editor of The Freeman, wrote it best in his eloquent and impassioned story last Tuesday entitled, Welcome home, Z ‘The Dream’ Gorres: “He was loved by fans for his being a gentle, humble and unassuming person. Following his miraculous recovery from a serious head injury he sustained in a fight that ended his boxing career in November last year, Cebuano fighter Z “The Dream” Gorres drew global attention and has gained, without doubt, more love and adoration. How does he look? Can he talk? Move? He looks phenomenal. I gripped his right hand. He didn’t just shake hands with me. He gripped it right back. Firm. Tight. A powerful, forceful grip we engaged in for a few seconds. The girl laughed. I did. So did the others. Z smiled. Z smiles. When he saw his children, he smiled. When he thanked the Aldeguers and the man who took care of him in Las Vegas and accompanied him all the way to our land, Dr. Ben Calderon, he smiled. When he was met at the airport by dozens and hundreds of fans and friends and fellow fighters, he smiled. Z cried. For he was not a world champion. He won’t be; he’ll never be when he fell to the floor that Friday November the 13th evening. He did not bring home to Mandaue the gift the city awaited: a glittering boxing belt. But he did more. Much more. For who, but a returning and healthy Z Gorres, could have commanded a convoy of more than 50 vehicles that greeted him at the airport and paraded the streets of Lapu-Lapu and Mandaue and Cebu? Not MP. “Even Pacquiao did not attract that many cars who joined the welcome,” said Manny Villaruel, who was one of the many who trooped to the Mactan airport. Z is no world champion. But he did more. Perfectly-said. For isn’t touching people’s lives our ultimate life goal? Isn’t it far nobler an achievement that just being one of boxing’s top-ranked? Thanks to Z. Thanks to his near-death experience. Thanks to his new life. Welcome home, Buchoy.